My friend Jon and I have been getting together some afternoons, to expand our creative cooking horizons. It’s fun to explore new ingredients, familiar staples and to challenge ourselves to come up with interesting new flavors and textures. This afternoon, we chose brown lentils, red bell peppers, fresh shiitake mushrooms (any mushrooms are tasty! 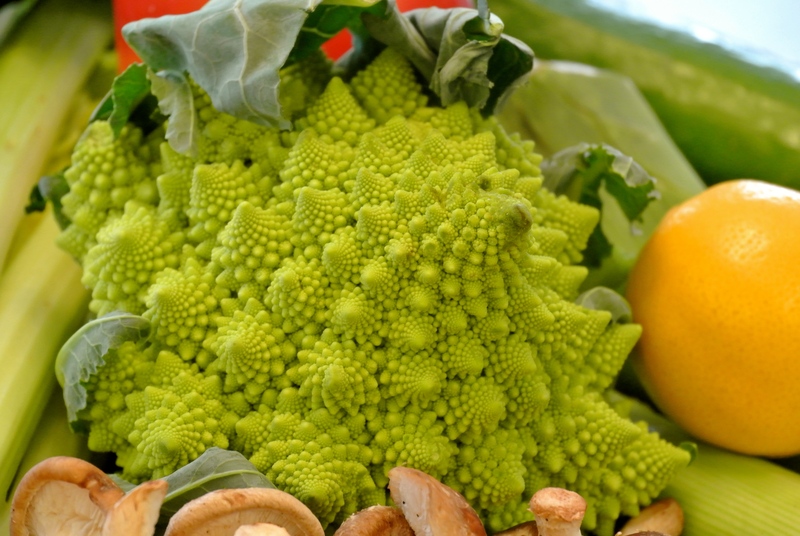 ), leeks, a zucchini, dinosaur kale, lemons, carrots, a can of fire-roasted, diced tomatoes and a head of romanesco cauliflower. For seasonings, I tend to look through my spice cabinet. This day, smoked paprika sounded good. 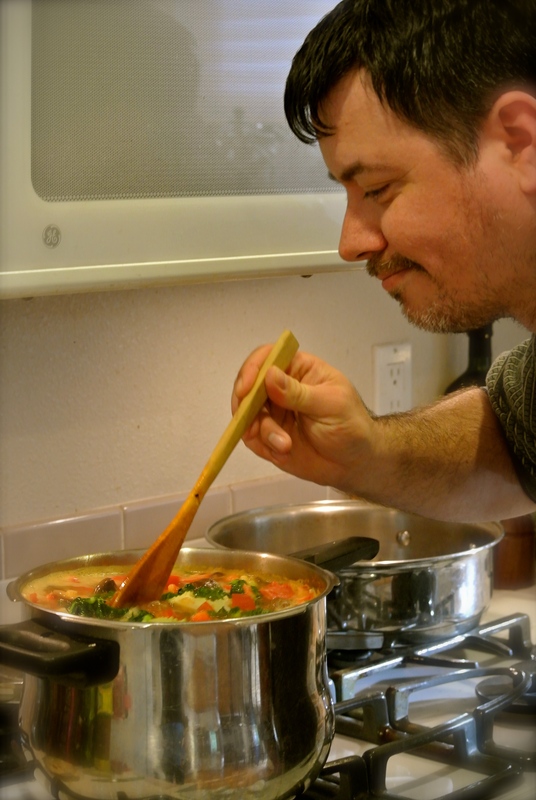 Jon and I decided to make a Spanish style lentil vegetable soup and a vegetable sauté. First we washed, sliced and diced all the vegetables. Next we divided them for the two dishes. This enabled us to make both meals quickly and have some leftovers. Soup always tastes better the next day anyway! For the sauté, the veggies are left with a bit of a bite, so they don’t turn to mush when reheated. Sauté 2 or 3 thinly sliced leeks in a bit of olive oil. When soft, add some chopped garlic, a couple of chopped carrots and a sprinkle of sea salt. Cook for a few minutes, then add a cup or two of the sliced mushrooms and turn up the heat. Next, add in some of the smoked paprika (start with a little, you can always add more later) and stir. Then add 1 cup washed and drained lentils, water or vegetable broth to cover the veggies by about 5 inches. Add the canned tomatoes. Bring to a boil, then turn down the heat and simmer for about 30 minutes. 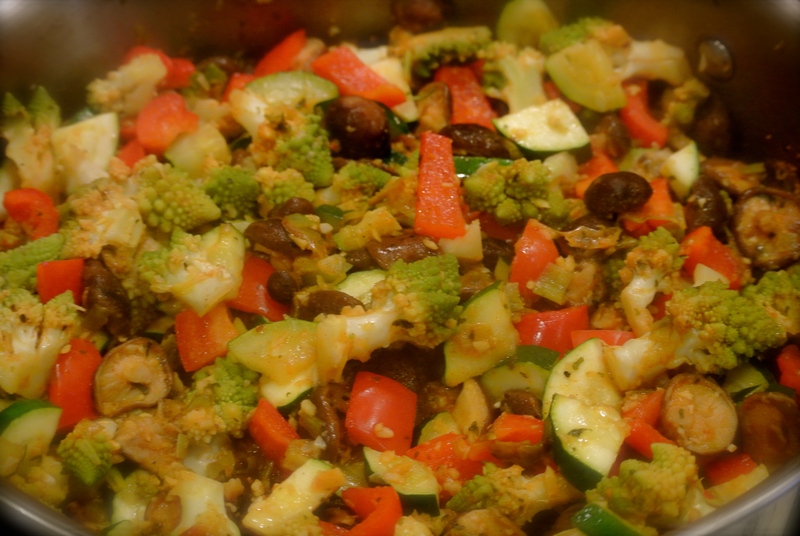 Then add some of the red bell peppers and romanesco (regular cauliflower is just as tasty!). Lastly, add the thinly sliced kale. If the soup is too thick for your liking, add more water or broth. Bring back to a boil, lower the flame, simmer gently until the lentils and veggies are tender. Taste, add more salt if needed, more paprika if you like, perhaps some cayenne or freshly ground black pepper. Squeeze some fresh lemon juice into both the soup and sauté at the end. It perks up the flavors. This soup is really quite flexible. I love the way the smoky spiciness of the paprika adds warmth and depth to the soup. Yummy on a cold day. Other times, I might have a longing for something curried, in which case I either use Indian curry powder or whatever Thai curry paste I have in the pantry. The Thai version is great substituting a can of coconut milk for the tomatoes. The Indian version is good either way. Play around with you favorite seasonings! Be adventurous! While the soup was simmering and filling the kitchen with a tantalizing aroma, we got out my big stainless steel sauté pan and heated it over moderate heat. Then we added some good olive oil. Moments later we added a couple of the sliced leeks, a lot of chopped garlic and a pinch or two of sea salt. After a few minutes we turned up the heat and added the rest of the mushrooms. Next we added what was left of the romanesco, the bell peppers, the sliced zucchini and a bit more salt. Sautéed it for about 15 minutes, we tasted and adjusted the seasoning to our liking. Serve with brown rice, quinoa or even pasta. Some days, I add a can of white beans (rinsed and drained) to this. 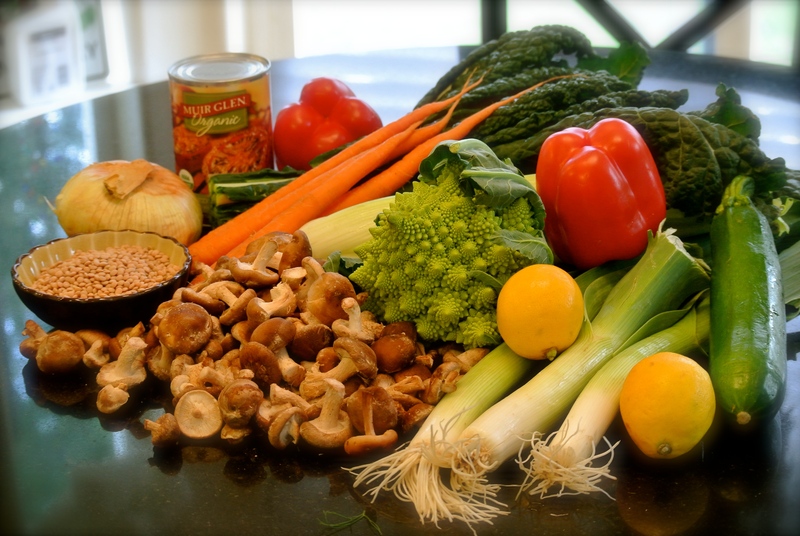 Simple, but if you use fresh, good quality vegetables, you’ll find that they don’t need much in terms of seasoning. Bon appetit! Thanks. Tasted just as good as it looks. I will look for that type of cauliflower in Southwest Florida at the international food store. It’s so delicious. And it stays crisper than cauliflower when cooking. My favorite part is that it looks kind of alien! Thanks for stopping by!